Excellent Condition, Honda Certified. Modern Steel Metallic exterior and Gray interior, Touring trim. Sunroof, NAV, 3rd Row Seat, Heated Leather Seats, DVD, Alloy Wheels. AND MORE! Leather Seats, Third Row Seat, Navigation, DVD, Sunroof. Rear Spoiler, MP3 Player, Power Third Passenger Door, Rear Seat Audio Controls, Remote Trunk Release. Honda Touring with Modern Steel Metallic exterior and Gray interior features a V6 Cylinder Engine with 280 HP at 6000 RPM*. Serviced here, Non-Smoker vehicle, Originally bought here, LOCAL TRADE, FLORIDA CAR. 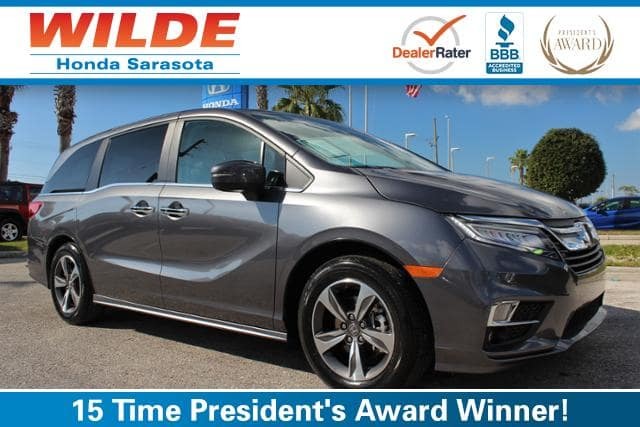 Edmunds.com explains The 2018 Honda Odyssey is the driver’s choice in the minivan class. A strong V6 gives you plenty of power for passing while the van’s precise steering and stable handling instill confidence..